Rebecca Cross, Crevasse (detail), 2006, nylon tulle and silk organza, 65 x 42 1/2 in. Image courtesy of the artist. In her work Rebecca Cross uses the shibori method, a traditional Japanese method of creating shape and color in cloth that yields an exploration of the art's response to the environment that houses it. The art itself holds the memory of its creation in its final form. It is a study of space and movement, texture and color. In this way, Cross's work is always changing to the viewer - always confronting the viewer's envisioned image of the piece - and the work becomes a "visual experience in which the viewer imagines, recognizes, or remembers the feeling of these textual elements." In her exhibition at The Sculpture Center, Cross utilizes the colors, the gossamer quality and layering possibilities present in the work to highlight how an experience changes in a continuum of time. Like a River will incorporate a performance with lighted fabric by Kora Radella and another dancer of Double-Edge Dance and a prerecorded concert of original electronic music composed by experimental, art-music composer Randolph Coleman, Cross's husband. The performance-concert will be accompanied by an exhibition of Cross's fabric based work in the Main Gallery. Rebecca Cross is an adjunct professor of surface design at the School of Art at Kent State University. She graduated from Oberlin College with a BA in English and from Kent States University with an MFA in Crafts. Her upcoming exhibits include a solo exhibit at the Morgan Paper Conservatory in Cleveland, OH. Whitney Huber, Ghost Dress, 2006, aluminum, chiffon, video, 5 ft. x 8 ft. x 3 ft., Image: courtesy of the artist. Shift, a two-person performance work written by Whitney Huber and performed by Huber and collaborator Joan Giroux, is a poetic enactment of a workday cycle. Fluxist, feminist, and Beckettian in spirit, the performers employ low-tech kinetic props - a crank, a wall, a bucket, hammer and nails, a light - and simple, repetitive gestures - hammering, cranking, removing nails - and work together to create a day-to-night image of mundane, beautiful labor. Whitney Huber is an artist and educator with background in visual fields and visual thinking, including studio arts, art history and cinema studies. Huber graduated from the University of Missouri-Columbia with a BFA in Sculpture, Painting, and Drawing. She continued her education at Ohio University where she graduated with a Master of Fine Arts in Sculpture and Art History as well as a Master of Arts in International Film: History, Theory, and Criticism. 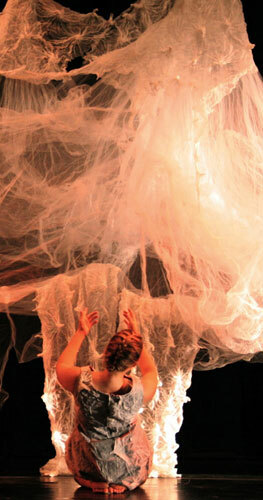 Her artistic work includes sculptural objects, costume, installation, video, performance and community arts. She teaches courses in studio art and design, art history and theory, and visual culture at Columbia College Chicago, and is working toward greater involvement with the city and youth in education and arts integration. Her recent exhibitions include The Project at Woman Made Gallery and Rymplecloth at Terrain in Chicago, IL. Joan Giroux, Associate Professor in the Art + Design Department at Columbia College Chicago, is an interdisciplinary artist, activist and educator. Her work has been exhibited and performed nationally and internationally at venues such as the Museum of Contemporary Art Chicago; Ace Gallery and Artist's Space in New York; and Amerika Haus Berlin and Künstlerhaus Hamburg in Germany. Among other honors, she has received a Marie Walsh Sharpe Foundation Studio Residency, Pollock-Krasner and Berlin Cultural Council grants, and commissions from Illinois' Morton Arboretum, the South Korean collective YATOO, and Lehniner Kulturinstitut, Germany. Jenny Fine, The Wake (or After You've Gone), 2011, front view of photographic backdrop on canvas, five masked performers, table, chairs, straw, record player, sound projection, Flat Granny, dimensions variable, Image: courtesy of the artist. Fine, drawing her inspiration from the stories that her grandmother told her when she was a young girl, uses contemporary and historical photographic processes to create ambiguous and troubling images and environments. Her performance at The Sculpture Center with costumed and masked actors and musicians from FiveOne Experimental Orchestra will be placed in a constructed set inspired by the locale of her grandmother's stories and the Alabama farm where she grew up. A soundtrack with Fine's voice and that of her now deceased grandmother will accompany the story. Jenny Fine (b. 1981, Enterprise, AL) received a BFA from the University of Alabama in 2006 and an MFA from The Ohio State University in 2010. In 2001, Fine taught at China's University of Geosciences in Wuhan, China. In 2002, she spent the summer working at Susana Homes Orphanage and Women's Shelter in Nigeria, Africa. In 2006, Fine was awarded a National Windgate Fellowship from the Center for Craft, Creativity and Design and a Fergus Memorial Scholarship from The Ohio State University in 2009. In 2011, Fine taught at The Ohio State University in the Department of Art; was selected as an Artist-in-Residence by The Wellington School in Columbus, Ohio, and was awarded by the Greater Columbus Arts Council an artist residency in Dresden, Germany. Fine has shown her work in solo exhibitions at Kentuck Gallery in Tuscaloosa, Alabama (2009), City Art Center in Delaware, Ohio (2011), and Geh8 in Dresden, Germany (2012). She exhibits her work in group shows throughout the United States including a recent exhibition at the Columbus Museum of Art (2012). R Ferris, Participation Conversation -after "The act of Drinking Beer with Friends is the Highest Form" ~ Tom Marioni, 2009, Image: courtesy of the artist. R Ferris seeks to eliminate the unspoken boundaries between a work of art and the viewer in order to pinpoint experiences themselves as the work of art. He is interested in "participations" and "engagement." The three elements of artist, the artist's piece and the audience all become one collaborative work of art that focuses on live, spontaneous and communal interaction with minimal verbal guidance. In "Galatea Glance," Ferris will incorporate a model portraying the Greek statue Galatea, the ivory statue carved by Pygmalion of Cyprus that was said to spring to life. R Ferris was born in Cleveland, Oh. He attended St. Lawrence University in Canton, NY and also received an MBA from Case Western Reserve University. He is continuing his studies at Cleveland Institute of Art. 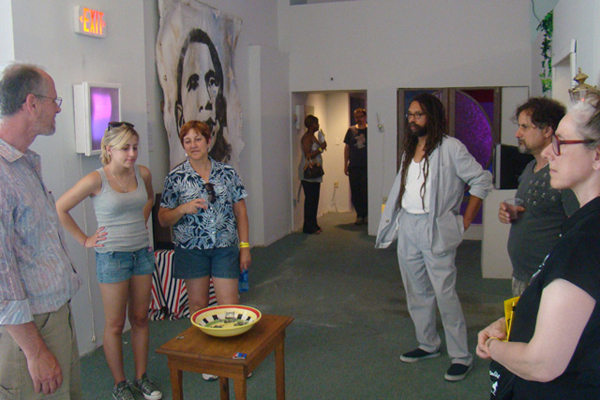 His most recent work was the "Crockpot Convivium - CLE" at Josaphat Arts Hall and Convivium33 Gallery in Cleveland, Oh. 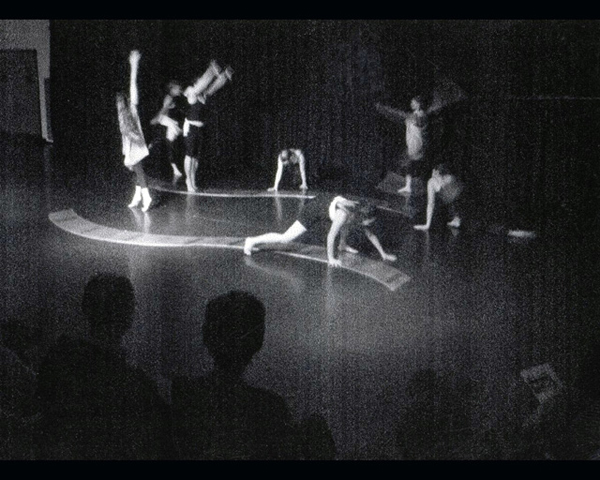 Susan Byrnes, Twist Serpentine, "What's Crossing Your Path", 2003, Performed by dancers at Eastern Michigan University, Image: courtesy of the artist. Performance artist Susan Byrnes, an artist of social practice, is creating an interactive performance piece, Mending Is Better Than Ending, that includes an audio tour of participants' favorite places in Cleveland. If you would like to participate, simply record your responses to her questions and email them to susanbstudio@gmail.com. Describe specific places and details about Cleveland that make it important/special to you - details you love that make it feel like home to you - particularly ordinary, everyday things you really like or notice about Cleveland. Your interview will be remixed and edited anonymously. For more information on how to participate, click here. Recordings must reach Susan by May 1. As the final performance of the 2013 W2S Performance Series, Susan is inviting Clevelanders of all ages to join her at The Sculpture Center on Saturday, July 27 from 2-6 in the afternoon to help her build an audio "house" and to decorate it with painted words and ideas about Cleveland. Cleveland Revival responds to the difficulties the city faced during the economic recession, especially with regard to the housing crisis. This project celebrates urban revitalization by collecting and retelling personal stories about people's affection for the place they live. Visitors to the interactive performance might be invited to participate in a "soundwalk" or neighborhood audio tour accessible by mobile phone, narrated by community members, which help visitors see the neighborhood through the eyes of its inhabitants. The project will include an edited and remixed "audio guide" to aspects of the city and a participatory art event for ALL AGES at The Sculpture Center on Saturday, July 27 from 2-6 pm. Susan Byrnes graduated from Eastern Michigan University with a MFA in Sculpture and from Syracuse University with a BFA in Photography. Her upcoming work include a 3 person show at the Fitton Center for the Creative Arts in Hamilton, OH and Inside the Box at Dayton Art Institute in Dayton, OH. 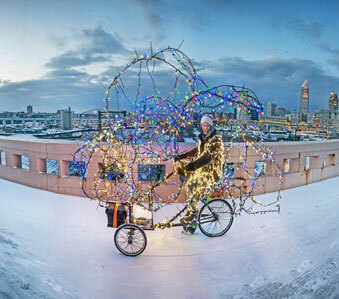 Jimmy Kuehnle, Twinkling Tricycle Tour of Enchantment, 2013, industrial tricycle, lights, battery, converter. Image courtesy of Rob Muller. Jimmy Kuehnle's performance work invades public space and breaks the repetitive cycle of urban life. For his new performance he will have a public and mobile component that is rooted in the origin site of The Sculpture Center, with participatory components navigated on the viewer's terms. His previous "novel experiences" stop traffic, attract crowds of people, and help to develop a spontaneous dialogue while also introducing new ways of thinking.